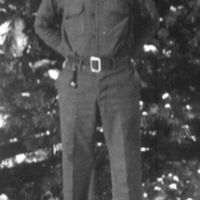 Private Francis D. Jordan (ca. 1918- 1945), likely before his deployment to Europe during World War II. Jordan was born in New York on September 15, 1918, but he migrated to Florida sometime after 1930, where he married his wife, Elise Barfield. Francis enlisted in the U.S. Army on July 11, 1944, at Camp Blanding. He was apart of the 274th infantry Regiment of the 70th Infantry Division. Pvt. Francis was Killed in Action (KIA) on February 14, 1945, during his service in France, and is currently buried at Epinal American Cemetery and Memorial in Dinozé, France. After his death, Pvt. Francis was awarded the Purple Heart, the Combat Infantryman Badge, the American Campaign Medal, and the World War II Victory Medal. Digital reproduction of original GRid=56373345">black and white photograph. “Private Francis D. Jordan.” RICHES of Central Florida accessed April 25, 2019, https://richesmi.cah.ucf.edu/omeka/items/show/9340.